the soy sauce, marinate for 2-3 minutes. and griddle for 1 minute, cut-side down until chargrilled. 3. 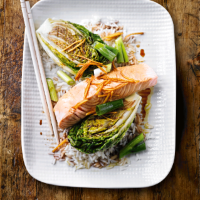 Serve the lettuce topped with the salmon, vegetables and the cooked rice.